The Modern Era nominees for the Pro Football Hall of Fame Class of 2019 were announced on Thursday, comprised of 102 players and coaches. These nominees consist of 47 offensive players, 39 defensive players, five special teams standouts and 11 coaches. Notably, six Chargers are among the 102 players and coaches. These nominees will be reduced to 25 semifinalists in November before being whittled down to 15 in January. Head Coach Don Coryell – A visionary who completely changed the offensive game forevermore as without Coryell, football as we know it today would not exist. Coryell forever changed how the game is played on both offense and defense with his innovative approach to the passing game. The ground-breaking manner in which he attacked through the air earned him the “Air Coryell” moniker as he compiled a 72-60 record from 1978-86, capturing three division titles along the way and twice reaching the AFC Championship Game. S Rodney Harrison – The Chargers’ fifth-round pick (145th overall) in the 1994 NFL Draft, Harrison immediately earned a reputation as one of the league’s hardest hitters. He spent the first nine seasons of his 15-year career with the Bolts. His top season came in 1997 when he posted a career-high 131 tackles to go along with 4.0 sacks and two picks. He posted two seasons with at least five picks for the Chargers and four campaigns with double-digit passes defensed. KR/PR Eric Metcalf – A 12-year NFL veteran, Metcalf spent the 1997 campaign with the Bolts. He returned 45 punts for 489 yards and three touchdowns while bringing back 16 kickoffs for 335 yards. Metcalf’s three punt return TDs proved to be a single-season career high. Overall, Metcalf finished his career with 351 punt returns for 3,452 yards and 10 touchdowns, along with 280 kickoff returns for 5,813 yards and two touchdowns. DE Leslie O’Neal – The most feared pass rusher in Chargers history, O’Neal is the franchise leader in the category with 105.5 sacks. That mark dwarfs the next closest player in franchise history (Shaun Phillips – 69.5). The defensive end played for the Chargers for 10 years from 1986-95, earning six Pro Bowls and three All-Pro honors over that span.  He was also the NFL Defensive Rookie of the Year in 1986 after recording 12.5 sacks. Head Coach Marty Schottenheimer – An NFL head coach for 21 straight years between 1984 and 2006, Schottenheimer spent the final five years of his career in the league with the Bolts. Taking the reins in 2002, he amassed a 47-33 record with the Chargers for a 58.8 winning percentage. LB Takeo Spikes – One of the most inspirational leaders of his generation, Spikes spent the final two years of his 15 NFL seasons with the Chargers. The linebacker appeared in 32 games for the Bolts, amassing 184 tackles, 1.5 sacks, four passes defensed and one pick. Overall, he totaled 1,080 tackles, 29.0 sacks, 19 interceptions and 11 forced fumbles in 219 career games.